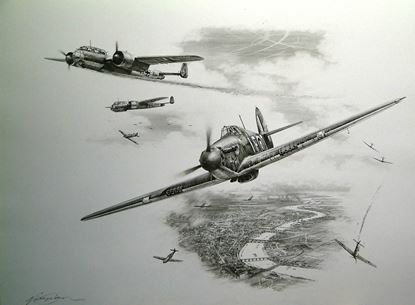 Nicolas Trudgian crafts some of the finest drawings and Print Remarques in Aviation Art. His devoted collectors have for years bombarded him with crazy and 'impossible' requests for Remarques (me included) - and he has not disappointed! Nick can draw ANY machine subject and here you will find some amazing examples of his work that include Tanks and even ships. Nick has also undertaken some very tricky drawings on wartime paper - difficult because the paper can be very brittle/rough and may not be that suitable for pencil work. Nevertheless, as you can see from a couple of examples in the Gallery - the results can be astounding and the stand-out of anyones collection! If you have an idea for a drawing from Nick, please contact to discuss!